Elsa Rae is an up and coming artist from Kansas City, Missouri. 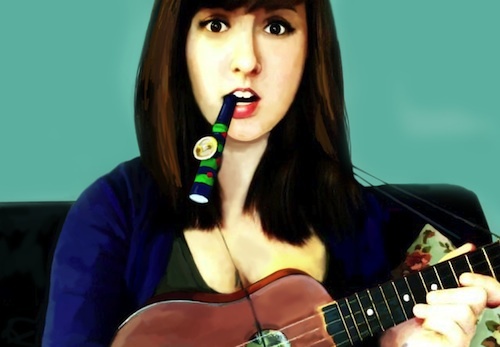 She has an army of tiny instruments and she isn’t afraid to use them. Ukuleles, kazoos, and toy pianos are not what you’d expect from typical music but she has managed to blend the instruments into a wonderful minimalistic sound that will surely have you tapping your foot. Elsa’s vocals add a deep layer to the tracks. Bubbly yet reflective, this album will become a favorite to those who like to spend warm days lying out in the park. Elsa was nice enough to answer some questions. Check out the interview below. TheKnifeFight: How would you describe your music to a new listener? Elsa Rae: Interesting (small) instruments played behind intriguing and thoughtful lyrics, influenced by a raggle-taggel mob of genres. Elsa: Elvis Presley. All the way. My mom had an Elvis Presley shrine in our basement and listened to him all the time. She’d constantly say, “No one can sing like Elvis.” This made me extremely jealous of Mr. Presley. I was still an only child then, so I wanted, and thought I deserved, all of my mom’s attention. I wanted her to say, “No one can sing like Elsa”, not Elvis. And thus, sprouted from envy of Elvis Presley, my musical life-style began. Elsa: I recently moved to Kansas City, Missouri, so I’ve been spending a lot of time biking around and exploring my new city! I love to explore. I also enjoy hula hooping, reading books on subjects which I know nothing about, taking long morning walks, playing backgammon, impersonating Christopher Walken, watching documentaries, drawing caricatures, having conversations with strangers, and de-seeding pomegranates. TKF: Which mediocre superpower would you rather have? The ability to time travel 10 seconds into the past or the ability to walk into a room and have it become the perfect temperature (to your liking) wherever you go. Elsa: Oh, the second option, hands down! I’m always too hot or too cold. Also, think of all the money I’d save on AC and heating in the winter! I’d spend that extra dough on some more tiny instruments. I’ve had my eye on a mini-harp…. Elsa: Right now, I’m taking life day by day. I’m currently going to school, working at a pizza joint, and slowly trying to gain a solid fan base. I’ve been making some wonderful musical connections here in KC. I actually just met an awesome DJ who’s begun remixing some of my songs into dub-step tracks. I’m pretty excited about it! I suppose my future goals are simply to keep meeting great people and to play as many live shows as time permits.